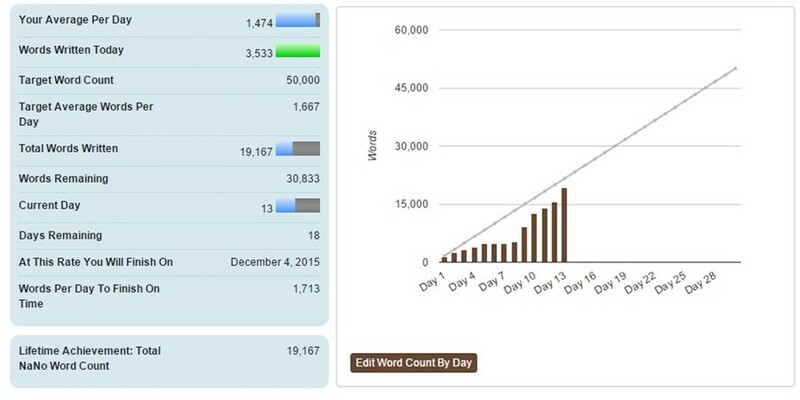 NaNoWriMo Day 13: Almost Caught up! I wrote 3,533 words today! I was aiming for 4,366, but I consider over 3500 quite an accomplishment, considering that I’m still fighting this terrible cold. Every n ow and then I am caught up in a fit of coughing and then I lose my writing streak and forget where I was. So here are the stats for day 13. I am hoping to be completely caught up by Sunday, and at least three days ahead by Friday. I’m certain that I can do it. I MUST believe that I can, otherwise I might fall into a pit of despair. That’s all for now. Time to go hang out with the coughing hubby and share our misery together while we watch Boardwalk Empire. < Previous NaNoWriMo Day 10: Catching up! That one-day word count is enviable even for a *healthy* person, so you’re totally killing it! Hopefully you’ll kick the cold soon! Thanks Kristi! I’ve been stringing words together in a mad rush for the past few days. Funny how some of my best ideas have come out through a fog of DayQuil and a desire to accomplish my goal! I don’t even allow myself to second guess what I am writing, and it has made all the difference! Sometimes we end up so far away from where we thought we’d be at the end of NaNo. It might be fun to re-read again later when you’re healthy and fog-free.